Do you want a dining room that feels both contemporary and glamorous? The kind of space that will wow your trendiest friends? When it comes to dining room design, one of the best ways to create drama and excitement is through lighting – in particular, through impressive chandelier lighting that is modern and spectacular. In today’s best homes, the right chandelier is both functional and fabulous. The right chandelier provides that bright lighting necessary to illuminate a large space while simultaneously creating a “wow factor” as a signature aesthetic statement. Whether your modern dining room is casual or formal, one of the best ways to catch the attention of all your guests is to choose a chandelier to serve as the room’s focal point. 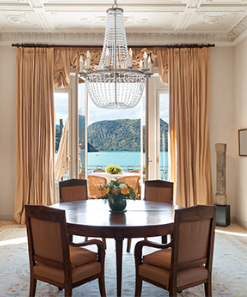 A crystal chandelier placed just above the dining room table can be the luxurious statement piece of your room. Classic crystal chandeliers are ornate, featuring many crystals and intricate design work – with chrome accents, these chandeliers beautifully complement a modern style. Sometimes you just want to add just a touch of sparkle to bring your modern dining room to life. If so, consider a chandelier with a pronounced metal finish that is trimmed with crystals to provide ambient lighting. If your dining room is small or you just need a little pizazz, these subdued but sparkling light fixtures can provide that perfect ethereal glimmer. If you have a large modern dining, you want to choose a chandelier that can give off light with a bright enough glow to illuminate your space. Ideally your chandelier should hang so that the bottom of the fixture is 30 -32 inches above the dining room table. The diameter of your chandelier should be somewhere between ½ to ¾ the width of your dining room table (or the diameter of the table if it’s a round table). If you have a large modern dining room with tall ceilings and a grand-size table to match, you will probably want to invest in an epic-sized chandelier. If your chandelier will be an accent fixture in your dining room, one of the ways to make sure it will stand out and enhance your space is to choose a colored chandelier. One way to achieve this look is with an artistic design that features colorful elements. Once lit, these chandeliers come to life in an array of colors that add whimsy and delight to your modern gathering space. Modern chandeliers are certainly not stuffy and formal. Sometimes they can be delightfully fun, especially when they bring an element of surprise to your space! A unique sculptural fixture or a design with futuristic flair can let your fun personality shine through. Consider choosing a chandelier in stark contrast to the other design elements of your dining room in order to capture the attention of everyone who enters. 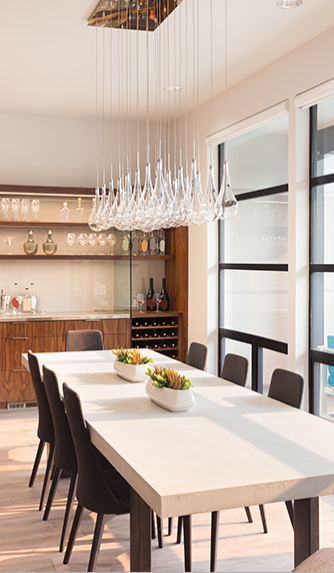 For more chandelier design ideas for your modern dining room, check out Going Lighting’s collection.